Srilankan Chicken Curry, an another famous recipe from the Srilanka. When comes to different cuisine, i'm always reluctant to try expect few, Srilankan cuisine falls to that expectation category :-), since the ingredients used in their cuisine are almost same as of my everyday cooking and i knew how it tastes, hence i'm quite comfortable in give it a try. 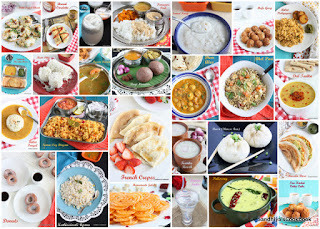 When i browse through their recipe, i had noticed that their recipes are almost similar to south Indian recipes especially south Tamilnadu and Kerala!!! As i said in my previous post, this curry is one such delicious side dish for roti and rice. The ingredients goes into that curry powder gives the wonderful aroma and taste to the curry. The flavor from coconut oil, coconut milk along with the curry powder takes this dish into whole new level and wanting you to eat more & more(personal experience), it's really hard to stop !!! In this recipe, tamarind is used to marinate the chicken instead of curd. Normally we use curd or tomato for tanginess when comes to non veg dish expect fish,so i wondered how chicken would taste in tamarind base, honestly it's not at all overpowering & the slight sweet from the tamarind goes well with chicken. I'm sure that from now on, this will be regular dish in my home !!! For vegetarian, try the same with yellow pumpkin. After i had prepared the Curry powder, I tried the same curry with pumpkin instead of chicken and it turned out so delicious. ST normally don't like any pumpkin curry, but he also liked this very much. Ok, enough with the stories, let's check out the recipe. First soak the tamarind in 1/4 cup of water for 30 mins, clean the chicken and wash it with turmeric powder and keep it ready. Extract the tamarind juice from the soaked tamarind and add the chicken & salt and mix it well. Let it soak for 30 mins, in the mean time, cut the onion into thin slices, tomato into small pieces, slit the chili and thinly slice the garlic and ginger and keep everything ready. Heat the pressure cooker add the coconut oil and the tempering ingredients. Let it fry in oil for 30 secs. Add the onions,ginger,garlic, green chili & curry leaves and saute till the onions becomes translucent and then add the tomatoes & give a good mix. Add the chicken along with the tamarind juice and then add turmeric & chili powder. Add the srilankan curry powder & enough water,mix it all well together and cook it for 3 whistle. Once the pressure is released from the cooker, open the lid ,put it on low flame and then add the salt (remember we already added the salt while marinating the chicken,so this is for curry only )& coconut milk. Let it simmer for 10 mins in the medium flame & switch off the flame. Tada, Srilanka Chicken Curry is ready. Serve it with roti or rice. If you have tamarind paste, use 1 &1/2 to 2 tsp instead of tamarind. After adding the coconut milk, keep the flame in low to prevent curdling. Freshly grounded srilankan powder gives great flavor to the curry. Use bone meat for best flavor. If you're using store brought srilankan curry powder, depends on the spice level of curry powder, adjust the amount of red chili powder. Many store brought powder have added the red chili too. I have used home made coconut milk, but you can use store brought also. Never tasted or used tamarind in chicken curry. Even I use curd or tomato. Am sure the curry tasted amazing. I still drooling over those pol roti. You whipped up a nice Sri Lank meal for thsi week. Enjoyed the virtual treat. Thanks Usha. Even i was not sure how it would chicken taste in tamarind base, but it was so good and lip smacking delicious. Very interesting chicken curry, am sure this chicken curry will definitely please my chicken loving family. Yeah, i'm sure that all chicken lovers will love this curry. I am sure the pumpkin curry you suggested in the previous post will work for vegetarians. the dish would definitely be a delight for the non vegetarians. Okay pumpkin here I come.Bookmarking to make when my EO comes down. I love the color of this curry. Looks very interesting. The entire meal looks amazing. I especially like the coconut rotis. Interesting Srilankan dish Sandhiya. Lovely pics! That's a wonderful choice!..looks so nicely done. I missed doing week 4, i chose sinhalese cuisine, dishes with coconut milk has an amazing flavor, i bet this chicken curry would have tasted amazingly well! !